Building a real-life dinosaur theme park seems like a bad idea, especially if you’ve ever seen Jurassic Park. At least in video game form you won’t be eaten by dinosaurs when things go poorly, which is where Jurassic Park Builder for iPhone and iPad comes in. It lets you craft your very own dinosaur park with none of the real-world implications or insurance policies. 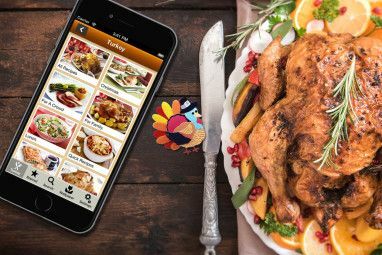 This review focuses on the iOS version of the application, but it is available on Android as well, and the apps are virtually identical. I am not going to beat around the bush here; this is a social game. If you’ve played Farmville or similar, then you probably have a good idea of what to expect. The reason this game is actually worth talking about at all is because of the franchise with which it is linked. After all, who doesn’t love Jurassic Park? Basically, you are building a dinosaur theme park; just like the movie. The park starts small, requiring you to demolish trees around the area to make more space. As you do so, certain parts of the jungle remain, and removing these allows you to find amber, which contains the dinosaur DNA that you need to place new living attractions in your park. As you play through the game, you will encounter plenty of missions designed to help move you forward. These include tasks such as collecting meat to feed your animals and adding more dinosaurs to your park. Completing these missions nets you XP, which levels you up, and money, which is used for building new stuff in your park. They give you specific goals to work towards, and they give things a little more purpose. As far as the controls go, it’s simply a matter of dragging and dropping things on the map and tapping buildings to collect money and feed dinosaurs. Games like this are suited well to the touch screen interface, and while Jurassic Park Builder doesn’t exactly rewrite the book for the genre, it makes effective use of the device and control options offered. Like all games of this kind, there are plenty of social elements tucked into the experience. For example, you can go visit your friends parks and see what they are up to. It connects to Facebook, so you can easily find friends in the game. Is this the best game on the App Store? No, of course not, but as far as social games go, it’s the most enjoyable I’ve played. 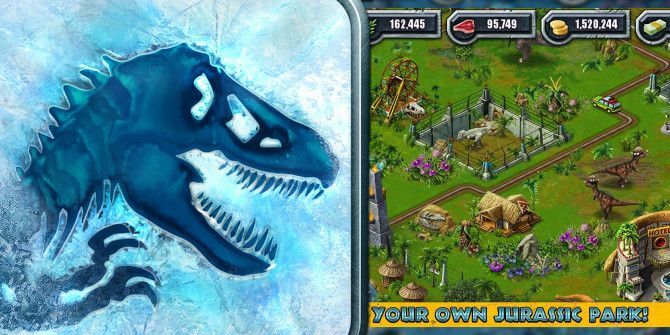 The Jurassic Park universe complete with the cast of beloved characters from the movie adds a lot to the game and makes it well worth a look, and it’s still on our Best iPhone Games Page to boot. As far as these freemium games go, Jurassic Park Builder actually looks pretty good. The environments are lush and colorful, and the dinosaurs themselves look fine. 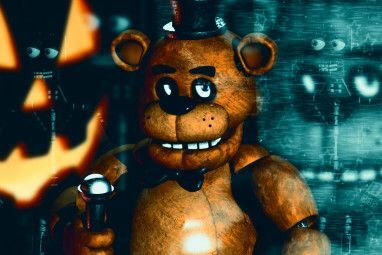 You can actually zoom in and see the attractions up close with a pinching motion, and even when you get right in there, everything holds up from a visual standpoint. The game features a decent soundtrack that fits the Jurassic Park theme well enough, but the sound effects seem to be a little much. It’s not to say they are bad by any means, it just seems to be a little excessive for the simple nature of the game. Hearing your dinosaurs roaring and making various noises is cool at first, but I found that it got old after a while, and I ended up playing with the game muted after about 5 minutes of listening. This is a free-to-play game Tetris Blitz Gives The Classic Puzzler A Free-To-Play Twist On iOS Tetris Blitz Gives The Classic Puzzler A Free-To-Play Twist On iOS What happens when you take the tried and true Tetris formula, make it free-to-play and then bring it to iOS? You end up with Tetris Blitz. Read More , and as such, it comes with everything you expect from a game of the sort. 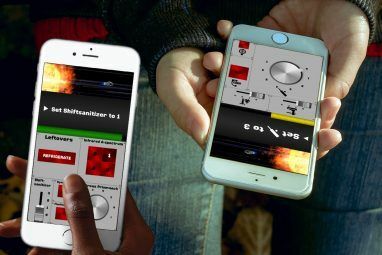 There are plenty of in-app purchases, but it is designed in such a way that you do not have to purchase anything, as long as you are patient. You can speed everything up, but if you are willing to wait a few minutes, you can progress just fine without spending any money. Shockingly, the in-app purchases are not shoved in your face much during the game. This came as a surprise, as many similar titles feature incredibly intrusive reminders that you should spend money to progress. As far as the kinds of experiences go, this one offers a great value. If you are into the gameplay offered, it’s conceivable that you could probably play indefinitely (or until you get bored), and you can’t ask for much more value than that. If raising farms isn’t your thing, and dinosaurs are more your speed, then you will love Jurassic Park Builder. Remember: whether it’s cute fluffy animals in Farmville or bloodthirsty velociraptors in Jurassic Park Builder, they’re very similar games at the end of the day. This one’s free, so there is really no reason not to give it a go! Have you played Jurassic Park Builder? What did you think of it? Hit the comments section below and let us know!